It is official - a new study released concludes that men and women drift into different worlds when switched to ‘autopilot’ and hope for different benefits from future automotive advances. Women drivers are nearly twice as likely as their male counterparts to compile a mental shopping or ‘to do’ list whilst men listen to music, the radio or podcasts. 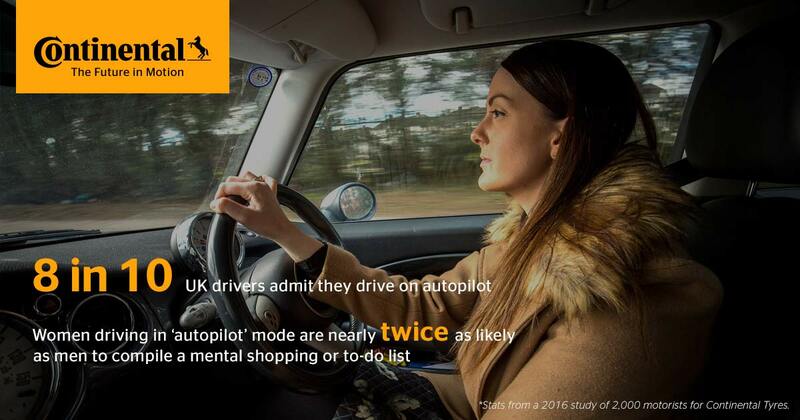 Eight in ten road users admit they sometimes drive on autopilot – zoning out for some or all of their journey. The issue is getting worse as the same study in 2009 found six in ten failed to concentrate throughout their trip, so in just over six years the amount of people driving on autopilot has increased by a third. The research is part of Continental Tyres’ ‘Vision Zero’, a long-term commitment to reduce accidents through innovative tyre technologies and automotive systems. 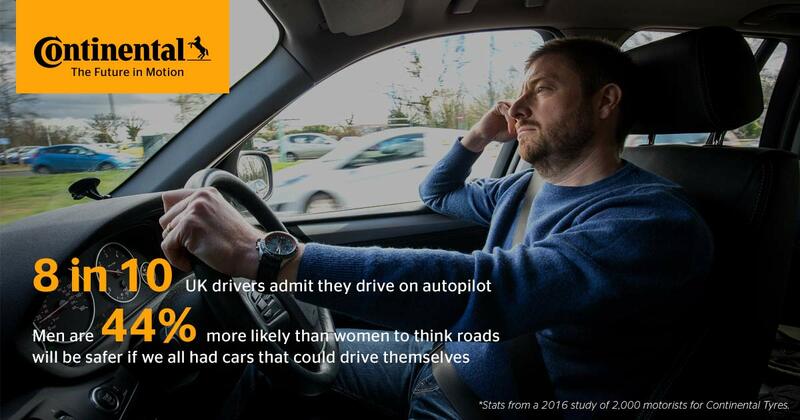 It was also revealed that men are far less worried that being an autopilot motorist impacts their safety, with 41 per cent not bothered if they sometimes tune out – 24 per cent more than with women. Mark Griffiths, safety expert for Continental Tyres said: “Although both men and women are physically engaged in driving, if they are distracted that presents a risk. It is possible that what they think about when ‘zoned out’ can make a big difference when they need to concentrate fully. The study of 2,000 drivers determined that women are 57 per cent more likely to be distracted on small side roads – when travelling slower – whilst men are 48 per cent more likely to switch to autopilot when on motorways. A quarter of all drivers say that being distracted happens as often as one in five journeys – with around one in six men admitting they often cannot remember the entire journey. "Without concentration reacting to something unexpected may simply take too long for us to respond safely. "The sheer monotony of driving can mean maintaining concentration is very difficult and tiring though it is vital that we get it right." As advances are made in automotive technology, more and more tasks are removed from the driver – like parking assistance – so the potential exists for there to be less to concentrate on. When asked about the priorities for development, men were nearly twice as keen as women to see driverless cars on the road, whilst female motorists are 23 per cent more likely to want technology to improve protection for people in the event of a crash. Mark Griffiths of Continental Tyres said: “It’s important that all motorists are mindful about their concentration levels when on the road and that they make sure they feel refreshed and fit to drive. “And whatever technology is introduced to assist their driving, it’s essential that driver remains in control and recognise their responsibility”.